These are some pieces I posted on my dev art page that I wanted to bring over here cuz I don't hate them yet! They range from fairly recent to pretty old. This took way too long to get to this stage and it was late so I never finished it.... dunno what he's supposed to be doing......... checking his watch maybe. 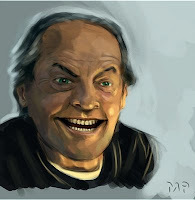 Just practising portraiture, I was trying to get the hang of making it actually look like the person I was drawing or painting so I thought Jack Nicholson would be a good one to do cuz he's got such a unique face. 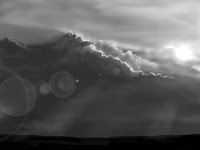 I did this a good while ago..... with a mouse......... it was difficult. 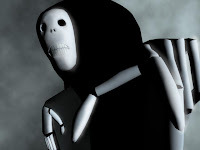 This is Death from my first student film 'The Last Stand'. I modelled, texture and rigged him but he's not my design I'm afraid, Steve McCarthy gets dibs on that one.